For other uses, see Ingushetia (disambiguation). The Republic of Ingushetia (/ɪŋɡʊˈʃɛtiə/; Russian: Респу́блика Ингуше́тия, tr. Respublika Ingushetiya, IPA: [rʲɪˈspublʲɪkə ɪnɡʊˈʂetʲɪjə]; Ingush: ГIалгIай Мохк, Ghalghaj Moxk), also referred to as simply Ingushetia, is a federal subject of the Russian Federation (a republic), located in the North Caucasus region. Its capital is the town of Magas. At 3,000 square km, in terms of area, the republic is the smallest of Russia's federal subjects except for the federal cities. It was established on June 4, 1992, after the Chechen-Ingush Autonomous Soviet Socialist Republic was split in two. The republic is home to the indigenous Ingush, a people of Vainakh ancestry. As of the 2010 Census, its population was 412,529. Largely due to the insurgency in the North Caucasus, Ingushetia remains one of the poorest and most unstable regions of Russia. Although the violence has died down in recent years, the insurgency in neighboring Chechnya has occasionally spilled into Ingushetia. According to Human Rights Watch in 2008, the republic has been destabilized by corruption, a number of high-profile crimes (including kidnapping and murder of civilians by government security forces), anti-government protests, attacks on soldiers and officers, Russian military excesses and a deteriorating human rights situation. The name Ingushetia is derived from the ancient village Angusht, which was renamed into Tarskoye and transferred to North Ossetia in 1944 after the deportation of 23 February 1944, a.k.a. operation "Lentil". The Ingush, a nationality group indigenous to the Caucasus, mostly inhabit Ingushetia. They refer to themselves as Ghalghai (from Ingush: Ghala ("fortress" or "town") and ghai ("inhabitants" or "citizens"). The Ingush speak the Ingush language, which has a very high degree of mutual intelligibility with neighboring Chechen. The Ingush are traditionally a classless society based on a clan system and unwritten law (approximately 350 clans live in Ingushetia today). Every clan, and each clan member, are viewed as equal. Unlike the neighboring nations in the Caucasus (including Chechens), the Ingush never had social superiors or inferiors. The Ingush/Ingushetia were also known by the following names: Gelia (American cartographer J. H. Colton), Tschetschna (German geographers Joseph Grassl and Joseph Meyer), Ghalghai/Gelgai (Self), Nakh (self, meaning "people"), Vainakh (self, meaning "our people"), Kist (Georgian), Gergar (Self), Dzurdzuk (Georgian), Ghlighvi (Georgian), Angushtini (Russian), Mack-aloni (Ossetian), Orstkhoi (self), Nart-Orstkhoi (self), Galash (self), Tsori (self), Dzheirakhoi (self), Khamhoi (self), Metshal (self), Fyappi (self), and Nyasareth (self). The self-namings represent different Vainakh tribes which make up the Ingush population today. The history of the Ingush is closely related to Chechens. Byzantine and Georgian missionaries partially Christianised the Ingush, although Christianity was weakened by the Mongol invasions. The remains of several churches, notably the Tkhabya-Yerd and the Albe-Yerd can be found in Ingushetia. Ingush converted to Islam at the end of the 19th century, which is almost three centuries after the beginning of Islamization in Chechnya. According to Leonti Mroveli, the 11th-century Georgian chronicler, the word Caucasian is derived from the Vainakh ancestor Kavkas. According to Professor George Anchabadze of Ilia State University "The Vainakhs are the ancient natives of the Caucasus. It is noteworthy, that according to the genealogical table drawn up by Leonti Mroveli, the legendary forefather of the Vainakhs was "Kavkas", hence the name Kavkasians, one of the ethnicons met in the ancient Georgian written sources, signifying the ancestors of the Chechens and Ingush. As appears from the above, the Vainakhs, at least by name, are presented as the most "Caucasian" people of all the Caucasians (Caucasus – Kavkas – Kavkasians) in the Georgian historical tradition." The Soviet-Russian anthropologists and scientists N.Ya. Marr, V.V. Bounak, R.M. Munchaev, I.M Dyakonov, E.I. Krupnov and G.A. Melikashvilli wrote: "Among Ingush the Caucasian type is preserved better than among any other North Caucasian nation", Professor of anthropology V.V.Bounak "Groznenski Rabochi" 5, VII, 1935. Professor G.F.Debets recognized that Ingush Caucasian anthropologic type is the most Caucasian among Caucasians. In an article in Science Magazine Bernice Wuethrich states that American linguist Dr. Johanna Nichols "has used language to connect modern people of the Caucasus region to the ancient farmers of the Fertile Crescent" and that her research suggests that "farmers of the region were proto-Nakh-Daghestanians". Nichols is quoted as stating that "The Nakh–Dagestanian languages are the closest thing we have to a direct continuation of the cultural and linguistic community that gave rise to Western civilization"
The Ingush have 89% of J2 Y-DNA which is the highest known frequency in the world and J2 is closely associated with the Fertile Crescent. The mitochondrial DNA of the Ingush differs from other Caucasian populations and the rest of the world. "The Caucasus populations exhibit, on average, less variability than other [World] populations for the eight Alu insertion polymorphisms analyzed here. The average heterozygosity is less than that of any other region of the world, with the exception of Sahul. Within the Caucasus, the Ingush have much lower levels of variability than any of the other populations. The Ingush also showed unusual patterns of mtDNA variation when compared with other Caucasus populations (Nasidze and Stoneking, submitted), which indicates that some feature of the Ingush population history, or of this particular sample of the Ingush, must be responsible for their different patterns of genetic variation at both mtDNA and the Alu insertion loci." 1855 Atlas Map of Turkey and the North Caucasus. Map of the American cartographer J.H.Colton. Top right corner, Ingushetia is labeled as Gelia, with Ingush cities: Nasra (Nazran), and Wladikaukas (Vladikavkaz) with Daryal Pass running on the west side of Gelia. Typical Ingush medieval castle. Majority of towers and walls were destroyed by Russian army in 19th and 20th centuries. Migration of Nakh people to the slopes of the Caucasus from the Fertile Crescent. Invention of agriculture, irrigation, and the domestication of animals. Neolithic era. Pottery is known to the region. Old settlements near Ali-Yurt and Magas, discovered in the modern times, revealed tools made out of stone: stone axes, polished stones, stone knives, stones with holes drilled in them, clay dishes etc. Settlements made out of clay bricks discovered in the plains. In the mountains, there were discovered settlements made out of stone surrounded by walls some of them dated back to 8000 BC. Invention of the wheel (3000 BC), horseback riding, metal works (copper, gold, silver, iron) dishes, armor, daggers, knives, arrow tips. The artifacts were found near Nasare-Cort, Muzhichi, Ja-E-Bortz (also known as Surkha-khi), Abbey-Gove (also known as Nazran or Nasare). War between the Alans, Tamerlan, Tokhtamysh, and the Battle of the Terek River. The Alan tribes build fortresses, castles, and defense walls locking the mountains from the invaders. Part of the lowland tribes occupied by Mongols. The insurgency against Mongols begins. "One map of the area during the Mongol period gives us a clue why there was not much written about the Vainakh— as the area of Chechnya-Ingushetia on that map is simply marked as ‘‘ungovernable.’’ This is not surprising, as the majority of armies moving north or south would be interested in passing through the mountains and getting to their ultimate destinations as quickly as possible— leaving the peoples between the two passes relatively unmolested.” – Schaefer, Robert W. “Insurgency in Chechnya and the North Caucasus: From Gazavat to Jihad” p.51. In 1991 the Jordanian historian Abdul-Ghani Khassan presented the photocopy from old Arabic scripts claiming that Alania was in Chechnya and Ingushetia, and the document from Alanian historian Azdin Vazzar (1395–1460) who claimed to be from Nokhcho tribe of Alania. Russian conquest of the Caucasus. 1558 Temryuk of Kabarda sends his emissaries to Moscow requesting help against Ingush tribes from Ivan the Terrible. Ivan the Terrible marries Temryuk's daughter Maria Temryukovna the Circassian (Kabardin) tsaritsa. Alliance formed to gain the ground in the central Caucasus for the expanding Tsardom of Russia against stubborn Vainakh defenders. After several attempts to gain the access of strategic Darial Gorge, Russian forces lose the battle near village Angusht. Hence the tribe which lived in the village and the nation as a whole is nicknamed Ingush. Ingush village Ghazhien-Yurt was renamed to Stanitsa Assinovskaya in 1847. Ingush village Ebarg-Yurt was renamed to Stanitsa Troitskaya in 1847. Ingush town Dibir-Ghala was renamed to Stanitsa Sleptsovskaya in 1847. Ingush village Magomet-Khite was renamed to Stanitsa Voznesenskaya in 1847. Ingush village Akhi-Yurt was renamed to Stanitsa Sunzhenskaya in 1859. Ingush village Ongusht was renamed to Stanitsa Tarskaya in 1859. Ingush town Ildir-Ghala was renamed to Stanitsa Karabulakskaya in 1859. Ingush village Alkhaste was renamed to Stanitsa Feldmarshalskaya in 1860. Ingush village Tauzen-Yurt was renamed to Stanitsa Vorontsov-Dashkov in 1861. Ingush village Sholkhi was renamed to Khutor Tarski in 1867. After the losses, the remaining Ingush clans resorted mostly to underground resistance. The Russians built the fortress Vladikavkaz ("ruler of the Caucasus") on the place of Ingush village of Zaur. Russian General Aleksey Petrovich Yermolov wrote in a letter to the Tsar of Russia, "It would be a grave mistake for Russia to alienate such a militaristic nation as the Ingush." He suggested the separation of the Ingush and Chechens in order for Russia to win the war in the Caucasus. In another letter from General Ermolov to Lanski (dated 12 January 1827) on the impossibility of forceful Christianization of the Ingush, Yermolov wrote: "This nation, the most courageous and militaristic among all the highlanders, cannot be allowed to be alienated..." The last organized rebellion (the so-called "Nazran insurrection") in Ingushetia occurred in 1858 when 5,000 Ingush started a fight but lost to superior Russian forces. The rebellion signaled the end of the First Russo-Caucasian War. In the same year, the Russian Tsar encouraged the emigration of Ingush and Chechens to Turkey and the Middle East by claiming that "Muslims need to live under Muslim rulers". It seems that he wanted to liberate the land for Ossetians and Cossacks. Some Ingush became exiled to deserted territory in the Middle East where many of them died. The remainder were assimilated. It was estimated that 80% of the Ingush left Ingushetia for the Middle East in 1865. The First Congress of the North Caucasus formed a Provisional Government of the North Caucasian Free State (SeveroKavkazskoye Svobodnoye Gosudarstvo) and in May 1918 declared the establishment of the North Caucasian Republic. The only country to recognize it was Turkey. Azerbaidzhan and Armenia (May 28, 1918). All three states then concluded independent treaties with Turkey, which similarly acknowledged the independence of the Northern Caucasus and concluded a treaty of friendship with it on June 8, 1918. An exchange of diplomatic notes then took place between the head of the German Extraordinary Delegation, General von Lossov, and the North Caucasian Minister of Foreign Affairs, Bammat, resulting in the de facto recognition by Germany of the independence of the Northern Caucasus. The capital of the new state was moved to Temir-Khan-Shura (Dagestan). The first prime minister to be elected was Tapa Chermoyev, a Chechen prominent statesman; the second prime minister was Ingush statesman Vassan-Girey Dzhabagiev who also was the author of the Constitution of the land in 1917. In 1920 he was reelected for a third term. In 1921 Russians attacked and occupied the country and forcefully merged it with the Soviet state. The Caucasian war for independence continued and the government went into exile. The Soviets confiscated the remaining Ingush properties by collectivization and dekulakization and unified Chechnya and Ingushetia into Chechen-Ingush ASSR. During World War II Ingush youth were drafted into the Russian army. In August 1942, for three weeks, Nazi German forces captured half of the North Caucasus and were stopped only at two Ingush towns: Ordzhonikidze (modern-day Vladikavkaz) and Malgobek. The battle between Ingush and Germans intensified at Malgobek and the small town was captured and recaptured four times for another month until the Germans finally retreated. Stalin planned the expansion of the USSR in the south through Turkey. Muslim Chechens and Ingush could become a threat to the expansion. In February 1944 near the end of World War II, Russian Army and NKVD units flooded the Chechen-Ingush ASSR. The maneuvers were disguised as military exercises of the southern district. After 13 years of exile, the Ingush were allowed to return to Chechen-Ingushetia (but not to Ordzhonikidze a.k.a. "Vladikavkaz" or the Prigorodny District). Most of Ingushetia's territory had been settled by Ossetians and part of the region had been transferred to North Ossetia. The returning Ingush faced considerable animosity from the Ossetians. The Ingush were forced to buy their homes back from the Ossetians and Russians. These hardships and injustices led to a peaceful Ingush protest in Grozny on 16 January 1973, which was crushed by the Soviet troops. In 1989, the Ingush were officially rehabilitated along with other peoples that had been subjected to repressions. 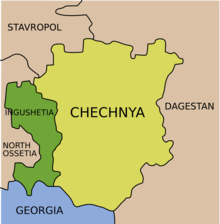 In 1991, when the Chechens declared independence from the Soviet Union to form the Chechen Republic of Ichkeria, the Ingush chose to secede from the Chechen-Ingush Republic. Thus, in 1992 the Ingush joined the newly created Russian Federation to try to resolve the conflict with Ossetia peacefully, also in the hope that the Russians would return their land as a token of their loyalty. 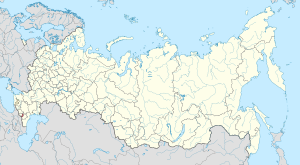 However, ethnic tensions in North Ossetia which were orchestrated by Ossetian nationalists (per Helsinki Human Right Watch), led to an outbreak of violence in the Ossetian–Ingush conflict in October-November 1992, when another ethnic cleansing of the Ingush population started. According to media reports, Ingush hostages were held in 1992 in the Beslan high school gymnasium. The hostages were all kept in the same gymnasium, deprived of food and water. At least one newborn and several dozen male Ingush hostages were executed. (In a possible retaliation in 2004, Chechen and Ingush militants took over 500 Ossetian hostages in Beslan high-school, the same building where Ossetian militants had held hundreds of Ingush hostages in 1992). Over 60,000 Ingush civilians were forced from their homes in the Prigorodny District of North Ossetia. As a result of the conflict, pro-Russian general Ruslan Aushev, a decorated war hero from the War in Afghanistan, was appointed by the Russian government as the first president of Ingushetia to stop the spread of the conflict. Partial stability returned under his rule. In 1994, when the First Chechen War started, the number of refugees in Ingushetia from both conflicts doubled. According to the UN, for every citizen of Ingushetia, one refugee arrived from Ossetia or Chechnya. This influx was very problematic for the economy, which collapsed after Aushev's success. The second Russo-Chechen war which started in 1999 brought more refugees (at some point there was one refugee for every Ingush citizen: 240,000 from Chechnya plus 60,000 from North Ossetia at the peak in 2000) and misery to Ingushetia. In 2001, Aushev was forced to leave his presidency and was succeeded by Murat Zyazikov, a former KGB general. The situation worsened under his rule. Many young Ingush men were abducted by Russian and Ossetian death squads. according to Human rights watchdogs Memorial and Mashr. The Ingush mountains are closed for Ingush nationals. The number of rebel attacks in Ingushetia rose, especially after the number of Russian security forces was tripled. For example, according to a Russian news agency a murder of an ethnic-Russian school teacher in Ingushetia was committed by two ethnic-Russian and ethnic-Ossetian soldiers; Issa Merzhoev the Ingush Police detective who solved the crime was shot at and killed by "unknown" assailants shortly after he had identified the murderer. At least four people were injured when a vehicle exploded on 24 March 2008. An upsurge in violence in these months targeted local police officers and security forces. In January 2008, the Federal Security Service of the Russian Federation launched a "counter-terrorism" operation in Ingushetia after receiving information that insurgents had been preparing a series of attacks. In the beginning of August 2008, the war between Georgia and South Ossetia broke out, in which the Russian Federation subsequently became involved. After the outbreak of the war, there were virtually no more attacks or abductions of Ingush civilians by "unknown" forces. Most of the Russian forces were transferred to North and South Ossetia 31 August 2008 Magomed Yevloyev, the head of Ingush opposition and the owner of the website ingushetiya.ru, was killed by Russian security forces Shortly before the unrecognised opposition group People's Parliament of Ingushetia Mekhk-Kkhel called for the recognition of the Russian semi-autonomous republic's independence, opposition activist Magomed Khazbiyev proclaimed, "We must ask Europe or America to separate us from Russia." On October 18, 2008, a Russian military convoy came under grenade attack and machine gun fire near Nazran. Official Russian reports of the ambush, which has been blamed on local Muslim separatists, said two soldiers were killed and at least seven injured. Reports from Ingush opposition sources suggested as many as forty to fifty Russian soldiers were killed. On October 30, 2008, Zyazikov was dismissed from his office (he himself claimed he resigned voluntarily). On the next day, Yunus-Bek Yevkurov was nominated by Dmitry Medvedev and approved as President by the People's Assembly of Ingushetia (later the title President was renamed to Head). This move was endorsed by major Russian political parties and by the Ingush opposition. Under the current rule of Yevkurov, Ingushetia seems much calmer, showing some semblance of the Russian government. Attacks on policemen have fallen by 40% and abductions by 80%. According to professor Johanna Nichols, in all the recorded history and reconstructable prehistory, the Ingush people have never undertaken battle except in defense. In the 3rd and 2nd centuries BC Pharnavaz, his son Saurmag the Iberian kings, and the relatives of Ingush people per Leonti Mroveli, received military assistance from Ingush people in defense of Iberia against the Kartli occupation. The Ingush regiment pounced upon the German "Iron Division" like an avalanche. It was immediately supported by the Chechen regiment. The Russian history, including the history of our Preobrazhensky regiment, does not know a single instance of a horse cavalry attacking an enemy force armed with heavy artillery: 4.5 thousand killed, 3.5 thousand taken prisoner, 2.5 thousand wounded. Less than in an hour and a half the "Iron Division" ceased to exist, the division that had aroused fear in the best armies of our allies. On behalf of me, the royal court and the whole of the Russian army send our best regards to fathers, mothers, sisters, wives and brides of those brave sons of the Caucasus whose heroism paved the way for the destruction of German hordes. Russia bows low to the heroes and will never forget them. I extend my fraternal greetings, Nicholas II, August 25, 1915. He was blind because of his wounds and walked with his left arm extended forward. His right hand rested on a gun holster. He walked along the parade grounds wearing a ragged uniform, but his head was held high. The entire division was shocked at the sight. Approaching a shell-hole, he turned his face toward the west. The German general suddenly saluted this last defender of the Brest Fortress, and the rest of the officers followed suit. The Red Army officer drew a handgun and shot himself in the head. He fell on the ground facing Germany. A deep-drawn sigh aired over the parade grounds. We all stood 'frozen' in awe of this brave man. In 1994–96 Ingush volunteers fought alongside Chechens in the First Chechen War. Aside from a few incidents (including the killings of Ingush civilians by Russian soldiers), Ingushetia was largely kept out of the war by a determined policy of non-violence pursued by President Ruslan Aushev. This changed after the beginning of the Second Chechen War, and especially since Murat Zyazikov became the second Russian appointed president of Ingushetia in 2002. The first major rebel attack of the conflict, in which a military convoy was destroyed occurred in May 2000 and caused the deaths of 19 soldiers. In the June 2004 Nazran raid, Chechen and Ingush rebels attacked government buildings and military bases across Ingushetia, resulting in the deaths of at least 90 Ingush people and an unknown number of Russian troops. Among them the Republic's acting interior minister Abukar Kostoyev, his deputy Zyaudin Kotiyev. In response to a sharp escalation in attacks by insurgents since the summer of 2007, Moscow sent in an additional 25,000 MVD and FSB troops, tripling the number of special forces in Ingushetia. Famous Ingush rebels. Top left: Ingush female-sniper Laisat Baisarova. Lower left: Sulom-beck Sagopshinski. Right: Akhmed Khuchbarov. 1800s–1860s: Insurgency against Russian conquest. 1860s–1890s: Raids of Ingush abreks on the Georgian Military Highway and Mozdok. 1890s–1917: Insurgency of Ingush resistance under Chechen abrek Zelimkhan Gushmazukaev and Ingush abrek Sulom-beck Sagopshinski, execution of Russian viceroy to Ingushetia colonel Mitnik by Ingush resistance fighter Buzurtanov. 1917–1920s: Insurgency of Ingush resistance fighters against combined Russian White Guards, Cossacks, Ossetians, and general Denikin forces. 1920s–1930s: Insurgency of Ingush people against Communists, executions of Communist leader of Ingushetia Chernoglaz by Ingush rebel Uzhakhov. Execution of Communist party leader of Ingushetia Ivanov by Ingush rebels. 1944–1977: Ingush rebels avenging the deportation of the Ingush nation. Scores of Russian army units and NKVD, KGB officers killed. 1992: Ossetian-Ingush conflict. In combat operations Ingush rebels capture armor which later transferred to Chechens or given back to Russian army after the conflict ended. 1994: Nazran. Ingush civilians stop Russian army, flip armor, burn military trucks which were on the march to Chechnya in Russian-Chechen war. First Russian casualties reported from hands of Ingush rebels. 1994–1996: Ingush rebels defend Grozny and participate in combat operations on Chechen side. 1999–2006: Ingush rebels join Chechen rebels, the independence war turns into Jihad. 13 July 2001: Ingush people protest "defiling and desecration" of historical Christian Ingush church Tkhaba-Yerdy after Russian troops made the church into a public toilet. Though Ingush are Muslims they highly respect their Christian past. 15 September 2003: Ingush rebels use bomb truck and attack FSB headquarters in Maghas. Several dozens of Russian FSB officers killed including the senior officer overseeing the FSB in Chechen republic. The several story HQ building is severely damaged. 6 April 2004: Ingush rebels attack Russian appointed president of Ingushetia Murat Zyazikov. He was wounded when a car bomb was rammed into his motorcade. 22 June 2004: Chechen and Ingush rebels raid on Russian troops in Ingushetia. Hundreds of Russian troops killed. 31 August 2008: Execution of Magomed Yevloyev Ingush dissident, journalist, lawyer, businessman, and the owner of the news website Ingushetiya.ru, known for being highly critical of Russian regime in Ingushetia. He was shot in the head. Awarded posthumously, and his name is engraved in stone on the monuments at the Journalists' Memorials in Bayeux, France and Washington D.C., the United States. 30 September 2008: A suicide bomber attacked the motorcade of Ruslan Meiriyev, Ingushetia's top police official. 10 June 2009: Snipers killed Aza Gazgireyeva, deputy chief justice of the regional Supreme Court, as she dropped her children off at school. Russian news agencies also cited investigators as saying she was likely killed for her role in investigating the 2004 attack on Ingush police forces by Chechen fighters. 13 June 2009: Two gunmen sprayed former deputy prime minister Bashir Aushev with automatic-weapon fire as he got out of his car at the gate outside his home in the region's main city, Nazran. 22 June 2009: Russian appointed president of Ingushetia Yunus-Bek Yevkurov was badly hurt when a suicide bomber detonated a car packed with explosives as the president's convoy drove past. The attack killed three bodyguards. 12 August 2009: Gunmen killed construction minister Ruslan Amerkhanov in his office in the Ingush capital, Magas. 17 August 2009: A suicide bomber killed 21 Ingush police officers and unknown numbers of Russian Internal Ministry troops which were stationed in Nazran, after he drove a truck full of explosives into a MVD police base. 25 October 2009: Execution of Maksharip Aushev, an Ingush businessman, dissident, and a vocal critic of Russian regime policies in Ingushetia. His body had over 60 bullet holes. Awarded posthumously by the U.S. Department of State in 2009. 5 April 2010: A suicide bomber injured three police officers in the town of Karabulak. Two officers died at the hospital as a result of their injuries. While investigators arrived on scene, another car bomb was set off by remote. Nobody was hurt in the second blast. 24 January 2011: A suicide bomber, Magomed Yevloyev (same first and last name as the slain Ingush opposition journalist Magomed Yevloyev), killed 37 people at Domodedovo airport, Moscow, Russia. 2012: Ingush rebels participate in war against Assad, Iranian, and Russian advisors in Syria which is largely viewed by the Ingush rebels as war against Russia and the Iranian-speaking Ossetians. The rebel Ingush commanders are veterans of Ossetian-Ingush conflict, wars in Chechnya, Daud Khalukhayev from Ingush village of Palanazh (Katsa), and a descendant of Ingush deportees of 1860's Syrian-born Ingush Walid Didigov. 6 June 2013: Accusation of Ingush rebel leader Ali "Maghas" Taziev in Rostov-On-Don regional Russian court, who was captured after he voluntarily given himself up in on 9 June 2010 to Russian forces in Ingushetia on the agreement that Russians will liberate his relatives held hostage on one of the Russian military bases. 27 August 2013: Execution of the head of security of Ingushetia Akhmet Kotiev and his bodyguard by Ingush rebels. Kotiev was actively involved in the assassination of Magomed Yevloyev. 10 December 2013: Ingush opposition leader Magomed Khazbiev, who was a close friend of assassinated Magomed Yevloyev, attends Euromaidan in Ukraine and participates in anti-Russian campaign there after which his parents were threatened and harassed in Russia. On his website he writes: "the fact that Putin's slaves harass my parents do not make any sense, if you [Russians] want me to stop you have to kill me like Magomed Yevloyev and Makhsharip Aushev". 2 February 2014: Russian FSB officially confirms that in the middle of December 2013 four North Caucasian instructors operate in Ukraine, and prepare Ukrainians for street battles against Russian interests. 20 April 2014: Famous Ingush human rights defender Ibrgim Lyanov stated that Ingushetia wants to separate from Russia and become an independent state using the example of the Crimean separation from Ukraine. 24 May 2014: Ingush rebel leader Arthur Getagazhev, 4 rebels, and 2 civilians were killed in action in the village of Sagopshi by Russian forces. 2 July 2014: After several months of denial, pro-Russian president of Ingushetia finally recognizes that Ingush rebels are fighting in Ukraine against pro-Russia forces. 2 July 2014: Ingush rebels attack Russian armored military convoy killing 1 and wounding 7 soldiers. 6 July 2014: Russian special forces prepared an ambush near the morgue in Nazran hospital where the body of Arthur Getagazhev was located. The intelligence reported that Ingush rebels will try to recover the body of the slain leader. The intelligence was correct. Radio Free Europe (section specializing in the Caucasus), reports that in the middle of the day 2 Ingush rebels attacked the ambush, according to unofficial source two rebels killed 7 and wounded 4 Russian FSB and spetsnaz officers in less than 40 seconds, after which the rebels left the scene unharmed. The source in Ingush police who wanted to stay anonymous said that exact number of killed are known only by the FSB but nobody would dare to declare if officially. According to pro-Kremlin LifeNews released video the attack lasted less than 19 seconds. 17 January 2015: Maghas. Rise of anti-Western sentiments. Over 20,000 Ingush citizens protest against European terrorism toward Muslims. 28 February 2015: Russian opposition leader Nemtsov's death linked to Ingushetia by Russian police. 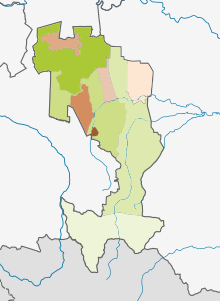 The Republic of Ingushetia (in green). Population: 412,529 (2010 Census); 467,294 (2002 Census). The Ingush, a nationality group indigenous to the Caucasus, mostly inhabit Ingushetia. They refer to themselves as Ghalghai (from Ingush: Ghala ("fortress" or "town") and ghai ("inhabitants" or "citizens"). The Ingush speak the Ingush language, which has a very high degree of mutual intelligibility with neighboring Chechen. According to the 2010 Russian Census (2010), ethnic Ingush make up 94.1% of the republic's population. Other groups include Chechens (4.6%), Russians (0.8%), and a host of smaller groups, each accounting for less than 0.5% of the total population. 1 2,897people were registered from administrative databases, and could not declare an ethnicity. It is estimated that the proportion of ethnicities in this group is the same as that of the declared group. The Ingush are predominantly Shafi'i Madhhab of Sunni Islam with a Sufi minority, which is often associated with one of two traditional Sufi orders: the Sufi tariqa Naqshbandi, represented in Ingushetia by the brotherhood of Deni Arsanov, and the tariqa Qadiriyyah, associated with Kunta-Haji Kishiev. Topographic map of the Caucasus. Ingushetia is located on the center right of the map. Ingushetia is situated on the northern slopes of the Caucasus. Its area is reported by various sources as either 2,000 square kilometers (770 sq mi) or 3,600 square kilometers (1,400 sq mi); the difference in reporting is mainly due to the inclusion or exclusion of parts of Sunzhensky Districts. The republic borders North Ossetia–Alania (SW/W/NW/N), the Chechnya (NE/E/SE), and the country of Georgia (Mtskheta-Mtianeti) (southwards). The highest point is the Gora Shan (4451 m). A 150-kilometer (93 mi) stretch of the Caucasus Mountains runs through the territory of the republic. Ingushetia is rich in marble, timber, dolomite, plaster, limestone, gravel, granite, clay, thermal medical water, rare metals, mineral water, oil (over 60 billion tons), and natural gas reserves. Ingushetia's climate is mostly continental. Up until the dissolution of the Soviet state, Ingushetia was part of the Chechen-Ingush ASSR of the Russian Soviet Socialist Republic. In the late 1920s – early 1930s the Soviet officials were eager to enforce the Chechen-Ingush merger as an “objective” and “natural” process. The Soviet linguist Nikolay Yakovlev, who was a supporter of the merger, suggested that an inclusive name of "Veinakh" (“our people”) had to be used for both the Chechens and Ingush. According to his views, the rapid urbanization and rapprochement of the Chechens and Ingush within one and the same republic might encourage the formation of a common culture and language and the establishment of a unified “Veinakh” people. During the late 80s, together with the separatist tendencies across the Soviet Union, the Second Congress of the Ingush People was held in Grozny on September 9–10, 1989. The gathering was directed at the top leadership of the Soviet Union, and included a request to "restore the Ingush people's autonomy within their historical borders, the Ingush Autonomous Soviet Socialist Republic with a capital in the right-bank part of the city of Ordzhonikidze".The Ingush Republic was to be organized out of six traditional Ingush districts (including the contested Prigorodny District). The rise of the Russian Federation gave the Ingushetians the independence they vowed for. During the 1990s, Ingushetia was ruled by its elected president Ruslan Aushev, a former Soviet general and hero of the war in Afghanistan. The head of government and the highest executive post in Ingushetia is the Head. The parliament of the Republic is the People's Assembly, composed of 34 deputies elected for a four-year term. The People's Assembly is headed by the Chairman. As of 2006, the Chairman of the People's Assembly is Makhmud Sultanovich Sakalov. The Constitution of Ingushetia was adopted on February 27, 1994. Ingushetia is a member of the Unrepresented Nations and Peoples Organization. The capital was moved from Nazran to Magas in December 2002. The most recent election was held in 2013. There are some natural resources in Ingushetia: mineral water in Achaluki, oil and natural gas in Malgobek, forests in Dzheirakh, metals in Galashki. The local government is considering the development of tourism; however, this is problematic due to the uneasy situation in the republic itself and the proximity of some conflict zones. However, Ingushetia continues to remain as one of Russia's poorest republics, largely due to the ongoing conflict, corruption and civil disorders. Unemployment is estimated to be around 53%, and growing poverty is a major issue. According to Russian media, Ingushetia has the lowest alcohol consumption in Russia. Ingush State University, the first institute of higher education in the history of Ingushetia, was founded in 1994 in Ordzhonikidzevskaya. Tamerlan Akhriev, inventor of a ceramic rotor engine. Ruslan Aushev, infantry general, hero of USSR, first president of Ingushetia. 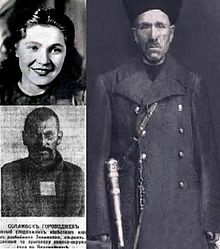 Issa Kostoyev, policeman who captured serial killer Andrei Chikatilo. Sulom-Bek Oskanov, Air Force general. Amurhan Yandiev, detective who captured serial killer Andrei Chikatilo. ^ "Russia's North Caucasus Insurgency Widens as ISIS' Foothold Grows". www.worldpoliticsreview.com. Retrieved October 3, 2017. Russia’s North Caucasus insurgency has gone relatively quiet, but reduced casualty numbers belie a still-worrying situation where long-standing grievances remain. ^ Walker, Shaun (April 4, 2017). "Why suspicion over St Petersburg metro attack is likely to fall on Islamist groups". The Guardian. ISSN 0261-3077. Retrieved October 3, 2017. A renewed crackdown on any suspected militant activity in the run-up to the Sochi winter Olympics in 2014 and the departure of many militants to fight in Syria led to a weakening of the North Caucasus insurgency. ^ "Ingushetia's cycle of violence". BBC. October 3, 2009. Retrieved January 7, 2011. ^ Khasan Sampiev. "The Land of Towers". Archived from the original on February 26, 2009. ^ "Microsoft Word - 4C04B861-0826-0853BD.doc" (PDF). Archived from the original (PDF) on February 25, 2012. Retrieved November 3, 2012. ^ "G.F.Debets". Archived from the original on September 27, 2006. ^ Ivane Nasidze; et al. (2001). "Alu insertion polymorphisms and the genetic structure of human populations from the Caucasus". European Journal of Human Genetics. 9 (4): 267–272. doi:10.1038/sj.ejhg.5200615. PMID 11313770. ^ "Вайнахи самый древний народ в России". YouTube. February 10, 2012. Retrieved February 28, 2014. ^ Броневский, Семен (July 20, 2017). "Новѣйшия географическия и историческия извѣстия о Кавказѣ". В Тип. С. Скливановскаго – via Google Books. ^ "Авторские Материалы". Archived from the original on February 17, 2008. Retrieved February 28, 2014. ^ "Аланский историк из чеченцев". Chechenews.com. August 29, 2010. Archived from the original on December 30, 2013. Retrieved February 28, 2014. ^ Категория: Мировая история. "Аланский историк". 95live.ru. Retrieved February 28, 2014. ^ Албогачиева М. "Многоликая Ингушетия". Groznycity.ru. Retrieved February 28, 2014. ^ "Немного о истории Владикавказа - часть 2 - 6 Января 2011 - История геноцида Ингушского|Чеченского народа". Vainax.ru. January 6, 2011. Archived from the original on March 5, 2014. Retrieved February 28, 2014. ^ a b c d e Johanna Nichols (February 1997). "The Ingush (with notes on the Chechen): Background information". University of California, Berkeley. Archived from the original on December 8, 2006. Retrieved February 10, 2007. ^ P.G.Butkov. Materials of the new history of the Caucasus years 1722–1803 St. Petersburg 1869 (page 165). ^ E.Bronevski. New geographical and historical perspectives of the Caucasus. Moscow, 1823 (vol.2 page 159). ^ U. Klaprot. Travel in the Caucasus and Georgia 1807–1808. Berlin 1812 (page 651). ^ N.Grabovski. Ingush nation (their life and traditions) Tiflis 1876 (page 2). ^ K.Raisov. New illustrated guide in the Crimea and the Caucasus. Odessa 1897 (page 295). ^ G.G. Moskvitch. Illustrated practical guide in the Caucasus. Odessa 1903 (pages 161–162). ^ N.M. Suetin. Geodesy of the Vladikavkaz. Vladikavkaz 1928 (page 12). ^ V.P. Khristianovich. Mountainous Ingushetia Rostov-on-Don 1928 (page 65). ^ E.I.Krupnov. Middle age Ingushetia Moscow, 1971 (page 166). ^ "Caucasus and central Asia newsletter. Issue 4" (PDF). University of California, Berkeley. 2003. Archived from the original (PDF) on February 27, 2008. ^ "Chechnya: Chaos of Human Geography in the North Caucasus, 484 BC – 1957 AD". www.semp.us. November 2007. Archived from the original on December 20, 2010. ^ Denikin, Anton Ivanovich (1925). Ocherki Russkoi Smuti. ^ Ben Cahoon. "Russian Civil War Polities". Worldstatesmen.org. Retrieved February 28, 2014. ^ "Общественное движение ЧЕЧЕНСКИЙ КОМИТЕТ НАЦИОНАЛЬНОГО СПАСЕНИЯ". Savechechnya.com. June 24, 2008. Archived from the original on February 23, 2014. Retrieved February 28, 2014. ^ "Вассан-Гирей Джабагиев". Vainah.info. Archived from the original on February 21, 2014. Retrieved February 28, 2014. ^ "Spetspereselentsi: history of mass repressions and deportations of Ingushes in 20th century". Ingushetiya news agency. March 2005. Archived from the original on October 19, 2007. ^ "The Ingush People". Linguistics.berkeley.edu. November 28, 1992. Retrieved August 7, 2014. ^ "Через 63 года в отношении защитников Малгобека восстановлена историческая справедливость". Российская газета. ^ Fires of Hatred: Ethnic Cleansing in Twentieth-Century Europe, Cambridge, Mass. and London: Harvard University Press, 2001, p. 96-97. ^ "Explore Chechnya's Turbulent Past ~ 1944: Deportation | Wide Angle". Pbs.org. July 25, 2002. Retrieved January 7, 2011. ^ "Prague Watchdog - Crisis in Chechnya - The deportation of 1944 – how it really was". Watchdog.cz. Retrieved August 7, 2014. ^ "The 60th Anniversary of the 1944 Chechen and Ingush Deportation: History, Legacies, Current Crisis". Archived from the original on January 20, 2009. ^ "Chechen Journal Dosh". Archived from the original on December 30, 2013. Retrieved June 14, 2013. ^ "The Ingush (with notes on the Chechen): Background information". ^ Ingushetia.ru news agency (January 2008). "35 years later. Ingush protest of 1973". www.ingushetiya.ru. Archived from the original on January 19, 2008. Retrieved January 16, 2008. ^ Economist 1992. Ethnic cleansing comes to Russia. The Economist, November 28, 1992, p. 60. ^ "Bashir Izmailov Witness Testimony". Archived from the original on December 15, 2005. Retrieved 2005-12-15. ^ "Ruslan Belkharoyev Witness Testimony". Old.ingushetiyaru.org. Retrieved February 28, 2014. ^ "ИНГУШЕТИЯ.РУ – Новости". Old.ingushetiyaru.org. October 26, 2005. Archived from the original on May 18, 2013. Retrieved February 28, 2014. ^ N.Evloev (January 2008). "A message of Nazir Evloev Press Secretary of Ingushetia MVD (Police)". www.ingushetiya.ru. Archived from the original on February 26, 2009. Retrieved January 20, 2008. ^ В Москве осетины похищают ингушей! (in Russian). Archived from the original on June 30, 2009. ^ "Ingush FSB Officer Shot Dead". ^ За похищениями ингушей в Москве стоят высокопоставленные чиновники Северной Осетии (in Russian). Archived from the original on April 4, 2009. ^ "Abduction Failed: Fifteen North Ossetia Law Enforcers Detained in Ingushetia". Memo.ru. Retrieved January 7, 2011. ^ "АНО "МАШР" – Главная". Mashr.org. Retrieved January 7, 2011. ^ M.Malsagov (September 2007). "Annexation of Ingush Mountains". www.ingushetiya.ru. Archived from the original on September 11, 2007. Retrieved September 7, 2007. ^ B.Polonkoev (August 2007). "The Murderers are not Insurgents". www.gazeta.ru. Retrieved September 29, 2007. ^ CNN (March 2008). "The Russian republic rocked by car bomb". Archived from the original on March 28, 2008. Retrieved March 24, 2008. ^ "BBC NEWS - Europe - Q&: Conflict in Georgia". bbc.co.uk. ^ BBC (August 31, 2008). "Kremlin critic shot in Ingushetia". BBC. Retrieved August 31, 2008. ^ Blomfield, Adrian (September 1, 2008). "Russia faces new Caucasus uprising in Ingushetia". London: Telegraph.co.uk. Retrieved January 7, 2011. ^ "Tension in Ingushetia after journalist's death". Ft.com. September 3, 2008. Retrieved January 7, 2011. ^ "Russians ambushed in Ingushetia". BBC News. October 18, 2008. Retrieved May 5, 2010. ^ "Two Russian soldiers killed in attack in Ingushetia". Monsters and Critics. October 18, 2008. Archived from the original on September 8, 2012. Retrieved January 7, 2011. ^ "The peaceful exception". The Economist. April 9–15, 2011. ^ Khasan Sampiev. "The Land of Towers". Archived from the original on February 17, 2008. ^ "Чечня FREE.RU - Новости Чечни, России и мира". Чечня FREE.RU. ^ Russian News and Information Agency RIA Novosti. "Russian News and Information Agency RIA Novosti: DEFENSE OF THE MOTHERLAND IS EVERY MUSLIM'S DUTY". ^ "Ingushetia accuses Russian military desecrating monuments". Russian newsru.com. July 15, 2001. ^ "FSB building in Magas bombed". English pravda.ru. September 15, 2003. Retrieved February 28, 2014. ^ Gheddo, Piero. "Magomed Yevloyev, critic of the Kremlin, killed by police". Asianews.it. Retrieved February 28, 2014. ^ "77 Names Added to Slain Journalists Memorial in Washington D.C". Fox News. March 30, 2009. ^ "Senior judge killed in Ingushetia". Al Jazeera. Retrieved September 24, 2012. ^ "Another Killing in Region Bordering Chechnya". nytimes.com. ^ "Ingush minister shot dead at work". BBC. August 12, 2009. Retrieved February 28, 2014. ^ "Secretary Clinton Honors Two Champions of Human Rights Day » US Mission Geneva". Geneva.usmission.gov. Retrieved February 28, 2014. ^ "Ingushetia hit by suicide attack". BBC News. April 5, 2010. Retrieved May 5, 2010. ^ "Syria crisis: Border town shows conflict's patchwork forces". BBC News. ^ "В Сирии воюют ингуши, и возглавляют одни из самых дерзких боевых групп повстанцев - HABAR.ORG". habar.org. Archived from the original on February 22, 2014. ^ "Магомед Хазбиев: Если хотите меня остановить - убейте". Ingushetiyaru.org. Retrieved February 28, 2014. ^ "На Украину выехали 4 инструктора боевиков с Северного Кавказа". Lifenews.ru. February 2, 2014. Archived from the original on January 8, 2016. Retrieved February 28, 2014. ^ "В Ингушетии заговорили о выходе из РФ по крымскому сценарию". censor.net.ua. Retrieved April 20, 2014. ^ "Российские официальные структуры сообщают об убийстве руководителя ингушских партизан – Артура Гетагажева" [Russian officials declare Getagazhev dead]. habar.org. Archived from the original on February 12, 2015. ^ "Ingush are fighting in Ukraine on both sides". ^ "Побочные эффекты". Эхо Кавказа. ^ "Война в Ингушетии продолжается" [War in Ingushetia continues]. Эхо Кавказа. ^ "Нападение боевиков на морг в Ингушетии сняла камера". ^ "В Ингушетии митинг против карикатур на пророка Мухаммеда собрал до 20 тысяч человек". newsru.com. ^ ЗАО ИД «Комсомольская правда». "Обращение главы Ингушетии к 20-тысячному антикарикатурному митингу: "Западная истерия вокруг ислама - это госэкстремизм"". ЗАО ИД «Комсомольская правда». ^ Andrew Roth [@ARothWP] (February 28, 2015). "Image of car purported to have carried Nemtsov's murderers has Ingush plates" (Tweet) – via Twitter. ^ "Nemtsov murder: Russian investigators probing several possible motives". ^ "О ПРЕОБРАЗОВАНИИ ПОСЕЛКА ГОРОДСКОГО ТИПА СУНЖА СУНЖЕНСКОГО РАЙОНА РЕСПУБЛИКИ ИНГУШЕТИЯ, Закон Республики Ингушетия от 25 ноября 2016 года №43-РЗ". docs.cntd.ru. Retrieved March 20, 2018. ^ "Каталог публикаций::Федеральная служба государственной статистики". Gks.ru. May 8, 2010. Retrieved February 28, 2014. ^ "Caucasus Times poll". Caucasus Times. May 20, 2010. Archived from the original on October 7, 2016. Retrieved August 28, 2016. ^ Stefano Allievi and Jørgen S. Nielsen (2003). Muslim networks and transnational communities in and across Europe. 1. ^ Johanna Nichols (February 1997). "The Ingush (with notes on the Chechen): Background information". University of California, Berkeley. Archived from the original on December 8, 2006. Retrieved February 10, 2007. ^ Социально-экономические характеристики (in Russian). Official website of Ingushetia. Retrieved April 19, 2013. ^ "Die Hoechsten". Gipfel-und-grenzen.de. Retrieved January 7, 2011. ^ "Медведев отправил в отставку президента Ингушетии". Old.lenta.ru. Retrieved January 7, 2011. ^ "В докладе Роспотребнадзора названы самые пьющие регионы России". ^ "Хмцсьяйхи Цнясдюпярбеммши Смхбепяхрер". Humanities.edu.ru. Archived from the original on July 19, 2011. Retrieved January 7, 2011. ^ Шах. "Вайнахские новости - Керамический роторный двигатель Тамерлана Ахриева ждет испытаний". E-kavkaz.com. Archived from the original on June 27, 2014. Retrieved August 7, 2014. ^ "Rotary Internal Combustion Engine". Ntpo.com. December 24, 2006. Retrieved August 7, 2014. ^ Идрис Базоркин. "Идрис Базоркин". Livelib.ru. Retrieved February 28, 2014. ^ "2008 Beijing Olympics Results: Rakhim Chakhkiev Wins Gold". Transworldnews.com. August 23, 2008. Archived from the original on June 30, 2009. Retrieved January 7, 2011. ^ "ИССА КОДЗОЕВ – Учитель, Писатель, Патриот". .rfi.fr. Retrieved February 28, 2014. ^ Гарант-Интернет (Garant-Internet), www.garweb.ru. "Обзор публикаций СМИ | Интернет-конференция Председателя Верховного Суда Российской Федерации Лебедева Вячеслава Михайловича | Гарант-Интернет". Garweb.ru. Retrieved January 7, 2011. ^ Kaku, Michio (June 10, 2012). "International Herald Tribune". International Herald Tribune. Archived from the original on September 25, 2008. Retrieved February 28, 2014. ^ "Амурхан ЯНДИЕВ: "Серийные убийства станут нормой жизни" - Известия". Izvestia.ru. Retrieved February 28, 2014. ^ "Я бледнел, но обнимался с Чикатило Амурхан Яндиев". Peoples.ru. January 28, 2007. Retrieved February 28, 2014. ^ "Яндиев Джамалдин Хамурзиевич (1916-1979)". Krkrub.kubannet.ru. Retrieved February 28, 2014. ^ "Тамара Яндиева". Kinopoisk.ru. July 23, 1955. Retrieved August 7, 2014. ^ "Яндиева Тамара - Биография - Актеры советского и российского кино - Биография Анны Яновской". Rusactors.ru. Retrieved August 7, 2014. ^ Заголовок. "Биография Тамара Яндиева". Peoples.ru. Retrieved August 7, 2014. ^ "Тамара Яндиева официальный сайт концертного агентства - организация заказ выступлений гастролей - актер ведущий - заказ артиста актера пригласить заказать – организация концертов - контакты - менеджмент". Concert-star.ru. December 12, 2010. Retrieved August 7, 2014. Конституционный закон №57-РЗ от 7 декабря 2010 г. «О государственном гимне Республики Ингушетия», в ред. Конституционного закона №2-РЗП от 4 июля 2011 г «О внесении изменений в некоторые законодательные акты Республики Ингушетия в связи с принятием Закона Республики Ингушетия от 11 октября 2010 года №3-РЗП "О поправке к Конституции"». Вступил в силу со дня официального опубликования. Опубликован: "Ингушетия", №211–212, 18 декабря 2010 г. (Constitutional Law #57-RZ of December 7, 2010 On the State Anthem of the Republic of Ingushetia, as amended by the Constitutional Law #2-RZP of July 4, 2011 On Amending Various Legislative Acts of the Republic of Ingushetia Due to the Adoption of the Law of the Republic Ingushetia #3-RZP of October 11, 2010 "On the Amendment to the Constitution". Effective as of the day of the official publication.). 27 февраля 1994 г. «Конституция Республики Ингушетия», в ред. Закона №1-РЗП от 8 мая 2013 г. «О поправке к Конституции Республики Ингушетия». Опубликован: Сборник Конституций субъектов Федерации "Конституции Республик в составе Российской Федерации", выпуск 1, 1995. (February 27, 1994 Constitution of the Republic of Ingushetia, as amended by the Law #1-RZP of May 8, 2013 On the Amendment to the Constitution of the Republic of Ingushetia. ). Верховный Совет РСФСР. Закон от 4 июня 1992 г. «Об образовании Республики Ингушетия в составе РСФСР». (Supreme Soviet of the RSFSR. Law of June 4, 1992 On Establishing the Republic of Ingushetia Within the RSFSR. ). Wikimedia Commons has media related to Ingushetia. Wikivoyage has a travel guide for Ingushetia.